Editor’s Note: There’s not a whole lot to say this one. What are the facts? The A-10 is indeed the most effective Close Air Support aircraft on the face of the earth, and its pilots are the grand masters of that discipline. It is still a devastating and effective weapon in today’s fight. Even so, the F-15Es and F-16s are being used to fly Close Air Support. Those aircraft are being relied on heavily in current operations for that purpose. McCain referencing CAS while using the attack on Daesh oil convoys (not CAS) as an example only muddies the waters. Saying F-15s and F-16s aren’t being employed is simply not true. But as always, click on the video link at the bottom and draw your own conclusions. 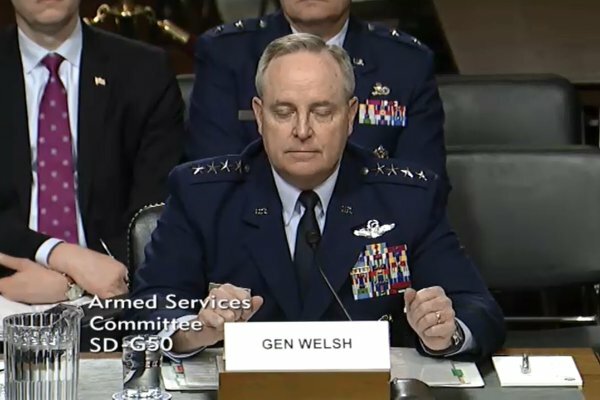 Welsh said he wishes the service could keep the A-10, but that the limited funding, resources, and maintainers available means the Air Force will need to shift personnel from the Thunderbolt II to the new F-35 Lightning II. “We have X amount of people and X amount of dollars,” he said. “And you have X amount of missions and the A-10 is carrying out those missions, general,” McCain cut in. The close-air support (CAS) role of the A-10 would be taken over by the F-15E Strike Eagle until the F-35 starts deploying after it reaches initial operating capability near the end of this year, Welsh said. But that answer didn’t satisfy McCain, who questioned why the Air Force wasn’t using the F-15 for CAS now. The article in its entirety can be viewed right here. Goldfein Nominated As Next CSAF!